The Peak to Brew Relay is the Northeast’s longest most scenic overnight Team supported relay race at 220+ miles. Teams of 6-12 Runners and 1-2 Support Vans will traverse the course over 42 unique legs. The Peak to Brew Relay provides a wide range of leg distances for elite and novice runners to enjoy. The course will take Teams through the heart of the Adirondack Park and through some of the most beautiful areas in the Northeast. 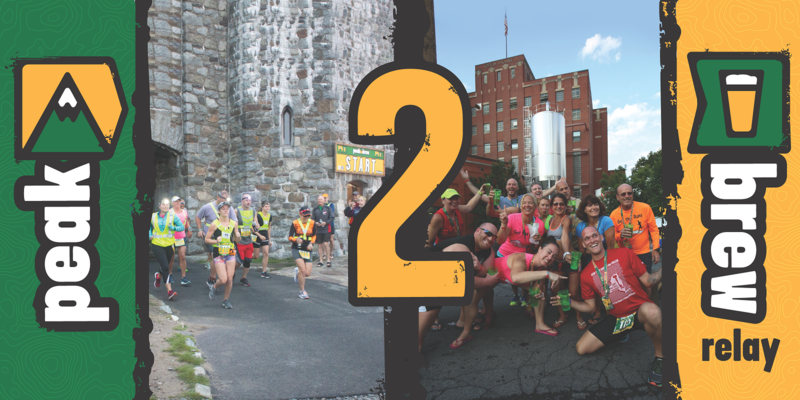 From an epic Start at the summit of Whiteface Mountain Veterans Memorial Highway to an unforgettable finish and celebration at the historic Saranac Brewery, the Peak to Brew Relay is one of the most unique and challenging events in the Northeast. The locally operated and founded P2B started with its inaugural exhibition run in 2015 with 5 Lucky Teams who were privately invited to take on the challenge. From 2015 P2B has grown with runners and the community and 1,000+ runners have completed the 220+ mile ULTIMATE Relay. Peak to Brew Relay, or P2B, is an Overnight Van Supported Team Relay event. What does this mean? Standard teams will make up a large majority of the teams and will be comprised of up to 12 runners and 2 vans. There will be 6 runners in each van (van #1/van #2) and the vans will “leap frog” each other along the course. Meaning that van #1 will start the race and runners 1-6 will run their legs and then van #1 will meet van #2 at a Major Exchange where van #2 will start running (runners 7-12). This will continue until both vans meet at the finish and cross the finish line together as a team (meeting runner #12 on their last leg). There will only be one runner from each team on the course at a given time as it is a Team Relay race. The course will consist of 7 sections where each runner from a standard team will run: VAN #1 = 4 Legs/Runner & VAN #2 = 3 Legs/Runner. Each section of the course will consist of 6 legs for a total of 42 legs for each team to complete. Runner individual legs will range from 2-12 miles in length. Average Total Combined Distance for a Runner in Van #1 = 15 miles & Van #2 = 20 miles. Runners will have on average 6-8 hours of rest between each of their legs. Rest time is dependent on the team pace (ex: fast team pace = less rest, slower team pace = more rest). Runners will transition to one another at Exchanges (Minor or Major). Minor exchanges are exchanges where runners in the same van transition to one another and are only for the van on that section of the course. Major exchanges are where the last runner in the van transitions to the first runner in the other van (ex: runner 6 in van #1 transitions to runner #7 in van #2). Major exchanges are where a larger majority of teams and runners will be located at and will also have an event venue setup (Food, Sleeping, Restrooms, Showers (at some), etc.). Follow the below Steps for Discovering more on P2B and How to Register Your Team for the ULTIMATE Relay Experience! !